Dr. Karen Ho received her Doctor of Veterinary Medicine degree from University of Wisconsin-Madison in 2012. Following graduation, she completed a small animal rotating internship at BluePearl Veterinary Partners in Tampa. From 2013 to 2015, she completed two dermatology specialty internships at University of Illinois and at Gulf Coast Veterinary Specialists in Houston. In 2018, Dr. Ho completed her dermatology residency and Master of Science degree at Auburn University. She served as the chief resident for the Small Animal Teaching Hospital from 2017 to 2018. 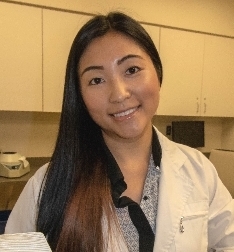 During her residency she won the first and second place ACVD Basic Science Research Awards at the North American Veterinary Dermatology Forum for her two research projects involving the role of rifampin in canine Staphylococcus pseudintermedius infections. Dr. Ho’s published articles include: Contact dermatitis: a comparative and translational review of the literature (Veterinary Dermatology 2015), Cutaneous candidiasis infection in two alpacas (Vet Record Case Reports 2017), Successful medical management of cutaneous Nocardia species infection in a dog receiving ciclosporin (Atopica) (Vet Record Case Reports 2017), and Minimum inhibitory concentration and killing properties of rifampicin against canine Staphylococcus pseudintermedius isolates from dogs in the southeast USA (Veterinary Dermatology 2018). Some of her hobbies include attending sporting events with her husband, playing tennis, hiking, drawing, and painting. She is a die-hard Green Bay Packers and Wisconsin Badgers fan and she is an avid fan of roller coasters and amusement parks. She enjoys spending time with her husband, their two dogs Toki and Remy, and their cat Simba.